My father was the reason I ever picked up a guitar in the first place. Wayne's World had a lot to do with it, too, but if my dad hadn't had guitars in the house, it might've just passed like any other adolescent phase, leading to another summer of basketball camp or Little League rather than trying to look like Angus Young in front of my bedroom mirror. Although I had taken violin lessons as a young kid, followed by a few years of piano, some things happened in the summer of '92 that changed the game for me: my grandmother, whom i was very close with, passed away, and Eric Clapton's Unplugged album had just been released, which proved a far better outlet for my grief than the usual Metallica or Guns 'n' Roses cassettes in my Walkman. I wanted to express my feelings by playing those songs, not just listening to them, and asked my dad to teach me how; big moment. My dad, Paul Sheganoski, had been a musician since he was 13 or so, starting out on guitar, and later moving to bass. Taking after my grandfather before him, a self-taught mandolin and harmonica player with a great ear, music dominated his young life growing up in Bayonne in the early '60s, taking lessons at Piero's (where I would hang out 30 years later), bringing his guitar on family trips, playing in The Electras and The Deltairs with his best friend Steve Zazenski, covering everything from '50s doo-wop to early rock'n'roll (the two forged a friendship that would last a lifetime). My grandfather bought him his first real guitar, a '62 sunburst Stratocaster, from Stark's Music store in Bayonne. 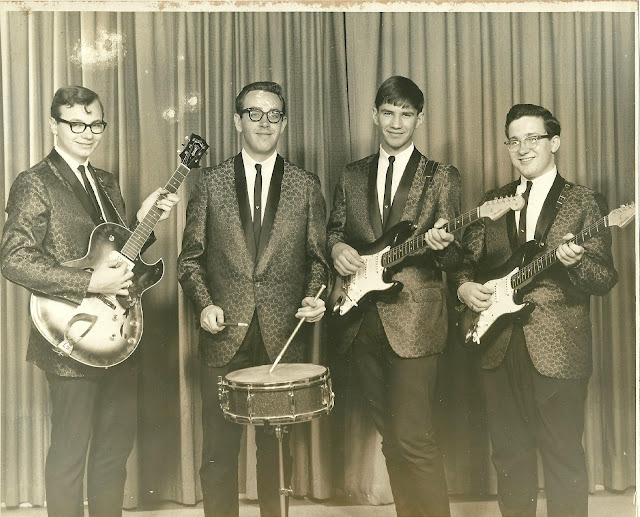 The Electras, featuring Steve Zazenski (far left), and my father (far right), circa '62. As a typical impulsive teenager, possibly trying to differentiate from his bandmate's identical guitar and having no idea of it's future value, he had that original sunburst Strat refinished at an autobody shop; the result was a cool metallic blue flake finish with a black pickguard, although he eventually traded it in anyway (Also, if anyone happens to come across a '62 Strat refinished in metallic blue flake with a black pickguard, call me!). The Ampeg Gemini I combo amp was also his, while the Jaguar and blonde Tremolux head and cabinet belonged to Steve and resided in his parents' basement rehearsal space. 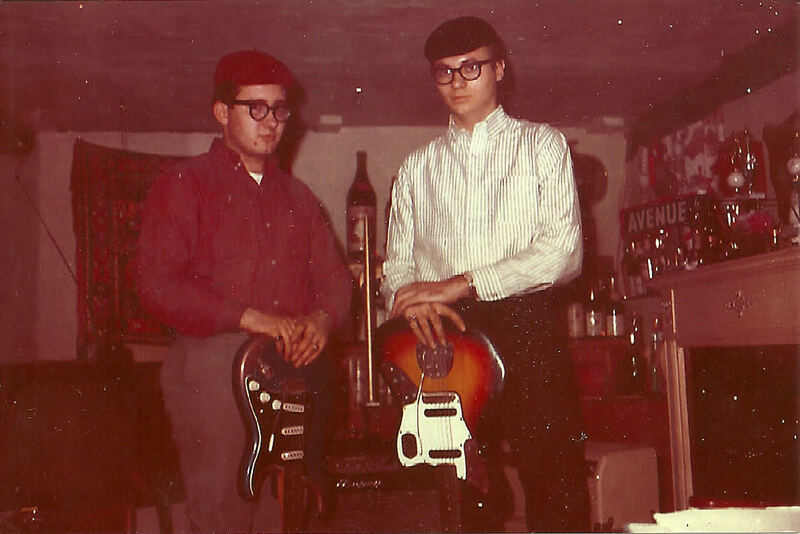 My dad (left), and his friend Steve (right), looking as cool as possible in Buddy Holly glasses and beatnik berets. The Deltairs even made a trip into New York City to cut a 45rpm vinyl demo, lugging all of their equipment on the bus and subway, tracking live to acetate master. With Steve's future wife Kathy Ambruzs on lead vocals, along with Chester Hodyl and Larry Suchac, the young group recorded a cover of "Earth Angel", the 1954 hit by The Penguins (and the same song Marty McFly played with Marvin Berry & The Starlighters at the 1955 Enchantment Under the Sea school dance). Eventually, by about '64, my father realized that a band with three guitarists might benefit from some low end, so he saved up for a Jazz Bass, and fortunately for me, anticipated the value of this instrument, to the extent that it's still in incredible shape over 50 years later (aside from some minor belt buckle rash). Along with his next purchase, a '66 blonde Telecaster that replaced the Strat as his preferred guitar for rhythm playing, he continued to gig locally, most notably with Mark Stein, eventual vocalist and keyboardist of the highly influential rock group Vanilla Fudge. My two favorite heirlooms, and one exhausted Pekingese. Closeup of the '64 Jazz, my dad's pride & joy. Playing my dad's Tele at B.B. King's in NYC last February, a special guitar for a special gig. He continued to play throughout the '70s in various bands, including Peace Train with friends Pete Henderson and Vinny Demitus, and also in a duo with my incredibly talented Godmother, Bernadette Golden. Speaking of Bernadette, it was my father who first placed a guitar in her hands, leading her towards a life of singing and songwriting, a degree in music education, and helped her parents pick out a cherry red '67 ES-335 for her as a graduation gift, a fitting instrument for a fantastic jazz vocalist. She still treasures that guitar to this day. 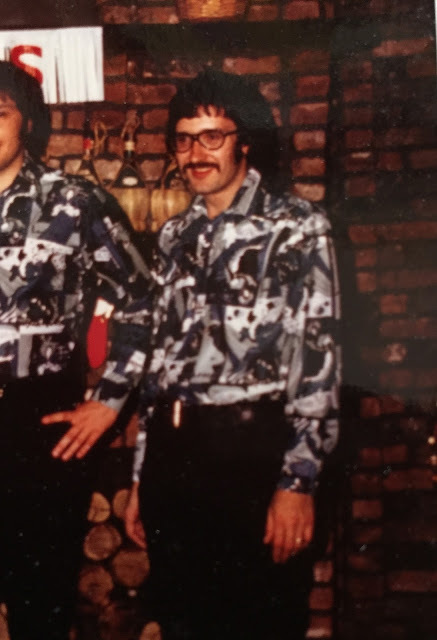 My dad in the 70s, if that wasn't already obvious. Then, after a 20-year hiatus, he decided to start up a cover band in his mid-50s, Flashback, for which I proudly served as roadie and soundman. It was payback for the concerts and rehearsals he drove me to as a kid, the loud music coming from my bedroom, my first guitar, school for sound engineering, and turning the garage into a recording studio; a free demo session was the very least i could do. The man sure had patience, as I often tested. Although my father was never much of a lead guitarist, he loved to both compliment and harass my playing, as he marveled over how I could perform all of the fast, tricky lead licks of guys like Clapton and Hendrix, yet lacked the "feel" that he had for rhythm and slower lines, which drove me crazy. For years, I couldn't understand what he was talking about... maybe it took some growing up on my part, feeling the blues a bit for myself, or maybe it'll be a constant quest and source of inspiration. Maybe it's that he's no longer around to hear me play, and that's the feeling I have now when I pick up a guitar, especially one of his... not a gig goes by that I don't wish he was there in the crowd. Paul Sheganoski is a great man that played guitar for fun. It was a very interesting post about your dad's life and how he encouraged you to begin practicing guitar. We have learned a lot about your childhood and the atmosphere you grew up.